Hi! 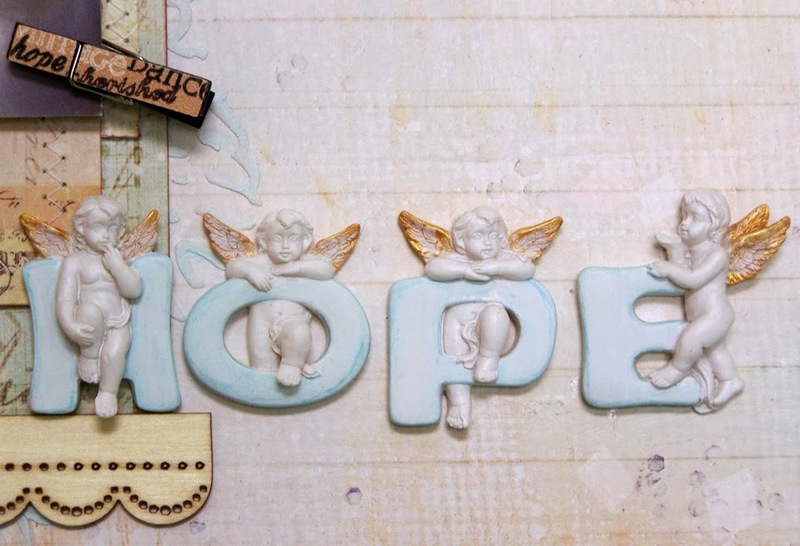 Sue Lelli here and My layout is all about HOPE. I am playing along with our ePicks Team Challenge ~ HOPE hosted by Andipants! I LOVE these resin Angels that I painted with Silks Acrylic Paints by Splash of Color. The colors I used are Emperor's Gold for the wings and African Jade (which I toned down a little with Gesso to match the paper) for the letters. 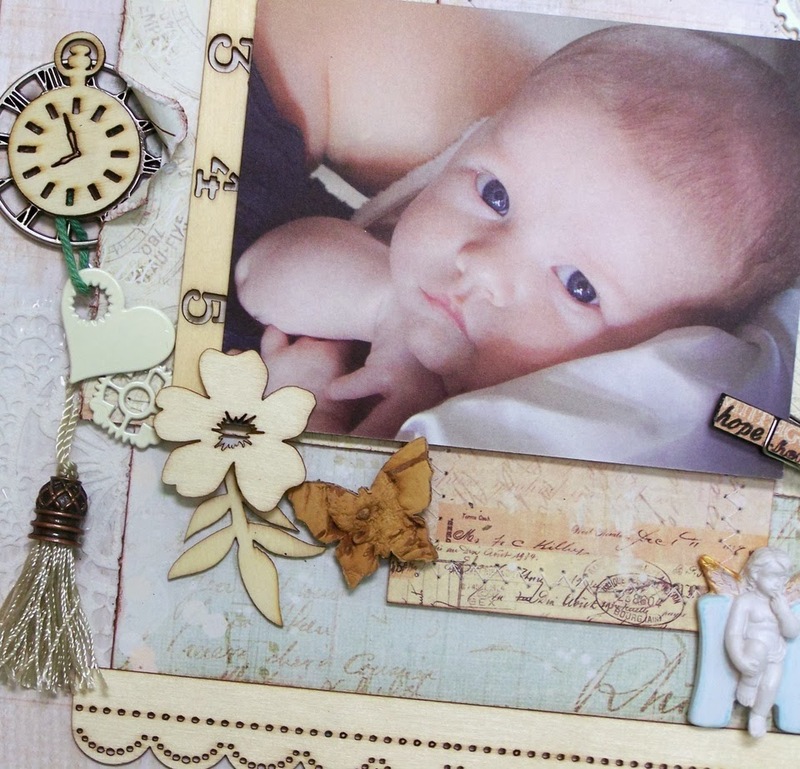 I used the photo from the actual baby announcement and built my page using Prima Elements that help me tell his story. The title Hope just says it all. 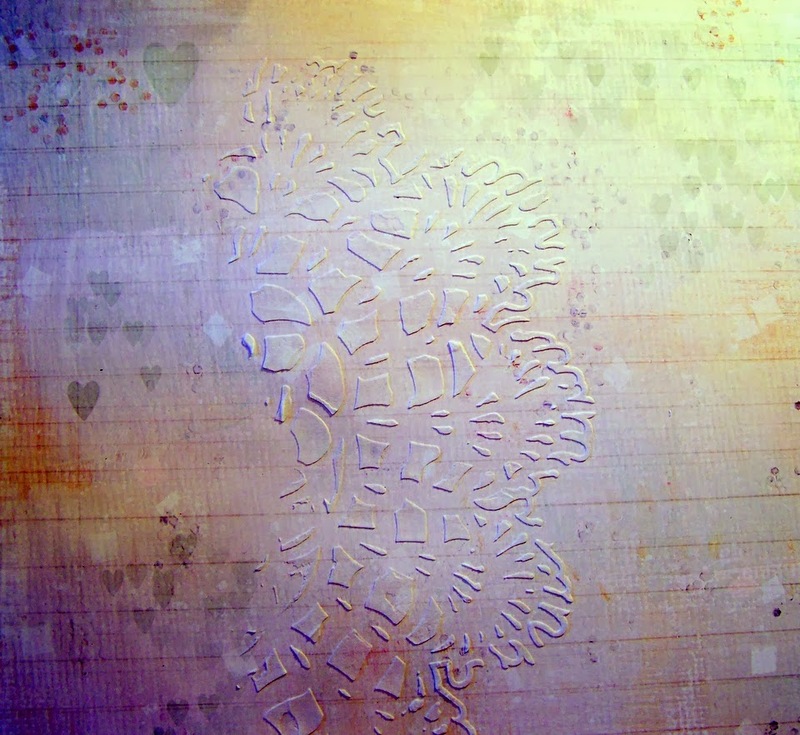 Here is a close up of the hearts (on the Prima "Princess Paper") I outlined with a Sakura Glaze pen. I used metal and wood gears and clocks with the hope that they can get his heart working again. See the tiny little plane on the clock? The family is waiting to hear when they can fly him to Boston Children's Hospital to have his surgery. I also used a lot of stitching to represent mending his heart. Here's his Beautiful little face surrounded by more heart gears and time pieces and a wood Prima flower to represent Florida where he lives along with a butterfly made of cork. Can you see the tiny clothespin? Even that has the word Hope on it. The ruler is to measure his growth because hopefully, when the surgery is a success, he will grow into a fine young man. 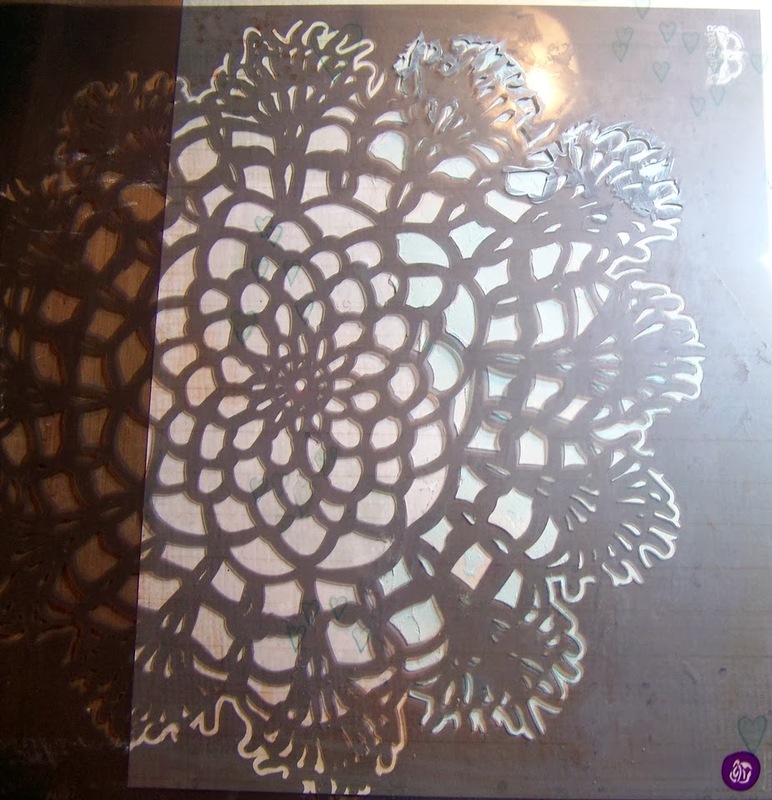 I LOVE this Prima Doily Stencil! I used it to apply my embossing paste and later my Silks paint. 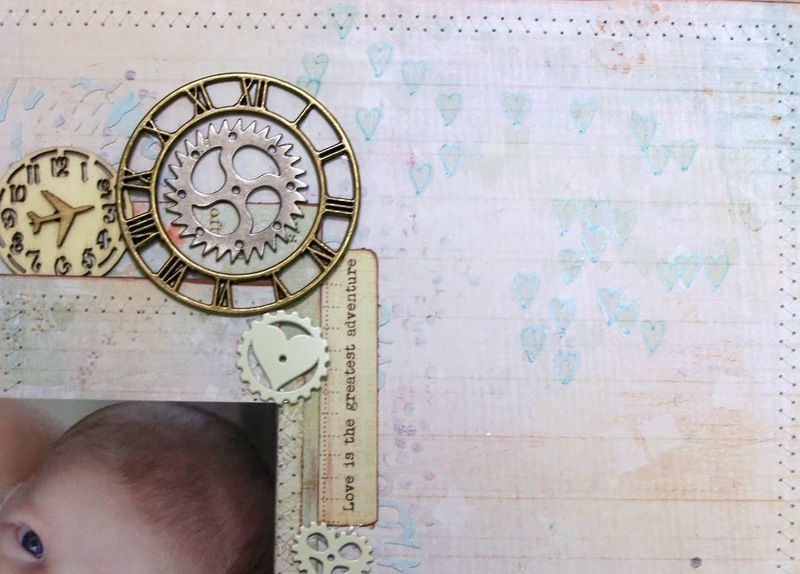 The embossing paste looked so COOL for my background but I thought it needed a little color. 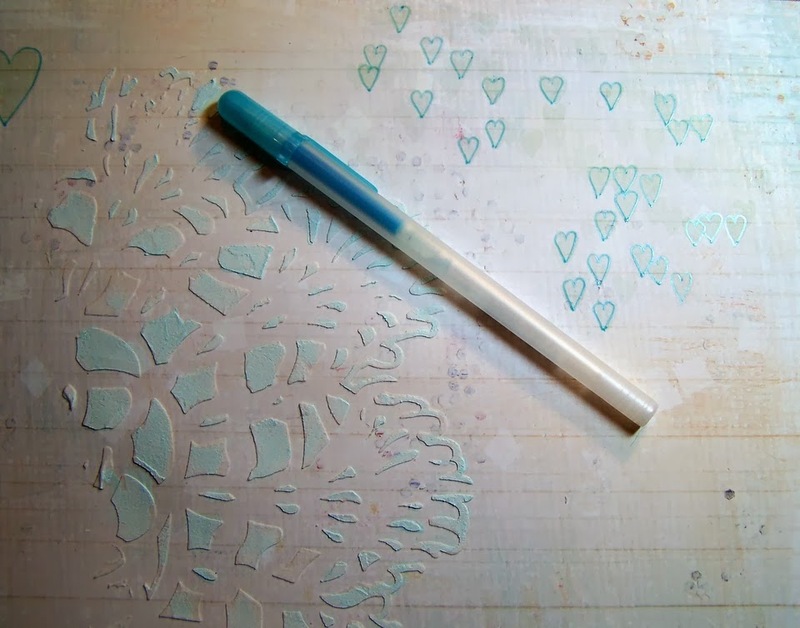 I painted the stenciled pattern with Silk Paint in African Jade mixed with Gesso and added outlines to the hearts with my Sakura Glaze pen. I hope you like my layout. Creating is how I cope with the emotions of life. I'm not sure I will give this to his parents. I am going to wait and see how he does with surgery and maybe I'll change the word to LOVE and frame it for them to put in his room. But right now, I am filled with HOPE and prayers. Sue, this is so full of love and hope. Not only is it gorgeous, but the details and their significance make this such a treasure. This layout truly embodies the spirit of hope...amazing and quite a keepsake. I, too, am hoping with all my heart (just like Anne) that the operation is a success. He's a sweetie! Sweet, sweet, sweet baby and page! Love the way it all comes together. Stunning layout Sue!!! And my heart goes out to your friend's sweet and beautiful little baby boy! My thoughts and prayers going up for him!!! I hope his surgery is successful and he does indeed get to grow up into a wonderful man! This layout is gorgeous, I love all the soft colors and I hope your friends baby gets well and stays well for a long time to come. Oh my word . . . breath taking layout Sue..wow!! Wow Sue...this is so soft and shabby. It's absolutely breath-taking.